The Badlands sprawl out over 2,000 square miles across the western edge of South Dakota’s Great Plains, a stunning landscape of hills and pinnacles carved out of clay and sand by the wind. The park’s signature herd of bison can often be spotted roaming around, adding to the surreal nature of the Badlands. 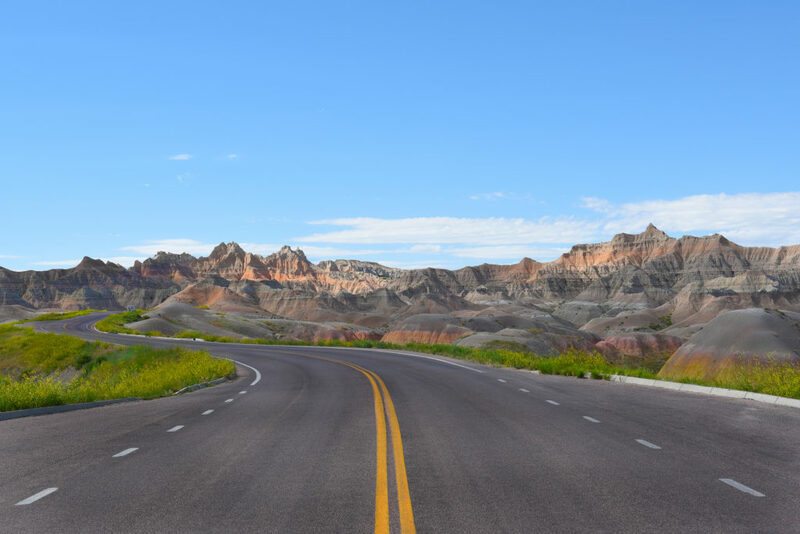 The Badlands Loop Road will take you through northwestern Pinnacles entrance to the Ben Reifel Visitor Center and offers plenty of parking places and viewpoints along the way. There are also marked hiking trails and you’ll have a chance to view one of the last remaining intact prairie landscapes in the country: the Buffalo Gap National Grassland. 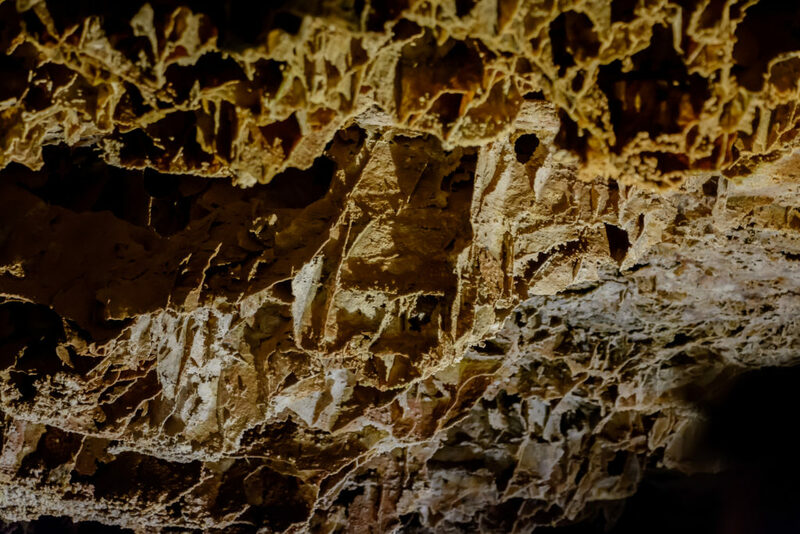 The first cave designated a national park, this extraordinary natural attraction is home the largest concentration of rare boxwork formations, as well as 28,295 acres of wildlife sanctuary. Rangers guide visitors underground on jaw-dropping tours of the honeycomb-patterned projecting calcite from the cave walls, which are also the source of its namesake barometric winds. There are different types of cave formations, including frostwork, popcorn, and boxwork. This is also one of the world’s longest caves, with 148 miles of mapped and surveyed passages—and counting. Give yourself plenty of time for the visit: above-ground there’s plenty of watchable wildlife, including bison, elk, prairie dogs, and much more. Sculptor Korczak Ziolkowski was commissioned by Henry Standing Bear, an Oglala Lakota Chief, to create a memorial honoring all North American Indians. The first blast was back in 1948—it’s currently the world’s largest mountain carving in progress, and four of Korczack’s 10 children and many of his 23 grandchildren still work on the project. Its slow progress could be due to the fact it’s financed by admissions (about 1 million people visit each year) and contributions, no federal or state funding is accepted. That being said: this is one amazing piece of work. 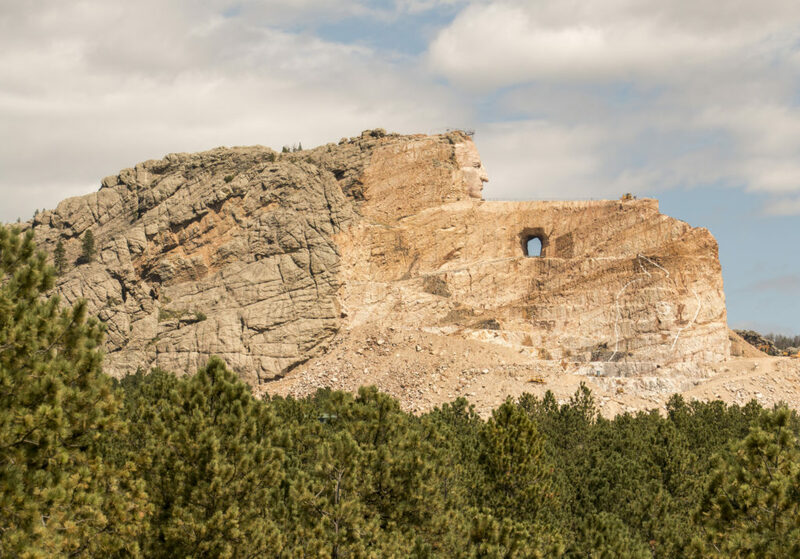 The entire carving is 641 feet long and 563 feet high; Crazy Horse’s face is 87 feet, six inches, and was completed in June of 1998. The horse’s head is 22 stories high! While you’re there, don’t miss a visit to the Indian Museum of North America® and the Native American Educational & Cultural Center®, repositories for American Indian artifacts, arts and crafts. Hungry? Stop in at the Laughing Water Restaurant for a dish of Tatanka Stew or authentic Native American Tacos. Who hasn’t heard of Mount Rushmore? 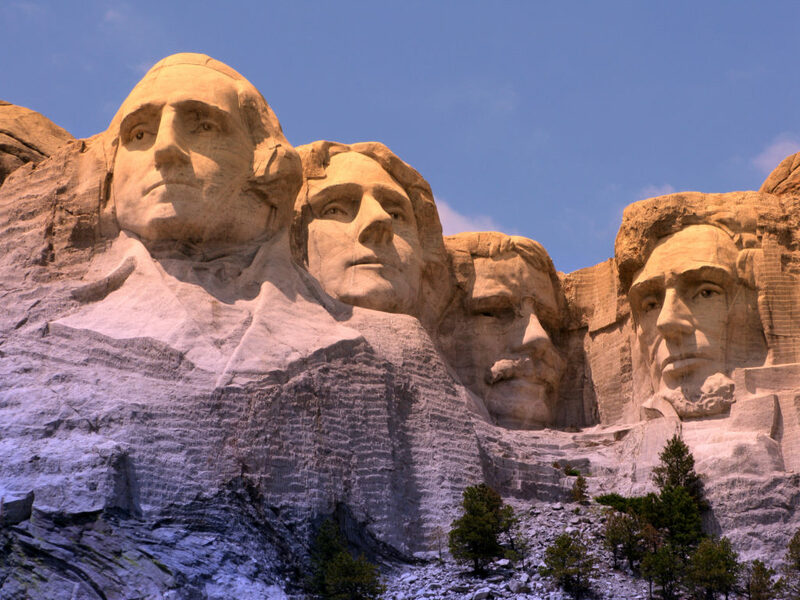 This is beyond classic: the figures of George Washington, Thomas Jefferson, Theodore Roosevelt, and Abraham Lincoln stare out over the gorgeous Black Hills of South Dakota. Host to almost three million visitors, both domestic and international, it welcomes them with stunning views as well as the Lincoln Borglum Visitor Center, with two theaters, a museum, and the Mount Rushmore Bookstore (don’t miss the film); and the Sculptor’s Studio, where rangers present talks during the summer months (it’s currently under renovation and rehabilitation and will reopen to the public in May 2019). If you’re in a hurry, visit the Center and mosey along the Presidential Trail (.6 miles long, 422 stairs) so you can get up close to the mountain sculpture, then have a bite to eat at the Carver’s Marketplace (finish up with an ice cream cone from the Ice Cream Shop!) If you have more time, check out one of the Ranger Led Programs or the Mount Rushmore Audio Tour. Founded in 1876, today the entire town is a National Historic Landmark and an ode to the likes of Wild Bill Hickok, Calamity Jane, Poker Alice, and their ilk. 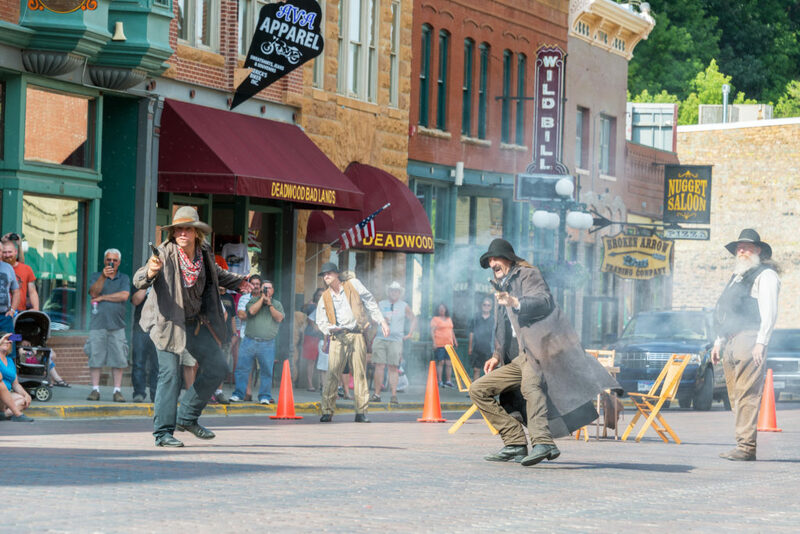 During the day check out the free Wild West re-enactments—at night head to the casino, take in a live concert or hang out at a comedy show. There’s something for everyone all year round, from museums to wineries to fun experiential tours. Tired after a long day of RVing? Head for a massage at one of the area’s day spas or give your credit card a workout at the shops. Big change from a tiny gold camp fueled by one of the great old rushes of the country. Check out their online event calendar for dates for their rodeos, food and wine festivals, professional snowmobile racing, pub crawls, and more.